Designing the railway of the future: Fire resistant composite materials and smart modular design. Mat4Rail is divided into two work streams. The objectives of the Materials work stream are to develop FRPs that meet all the railway environment requirements regarding Fire, Smoke and Toxicity, mechanical performance and cost effective manufacturing, to developed structural joints for FRPs, and to innovate the access door system by reaching improvements in term of weight, acoustic attenuation, thermal performances and cost. 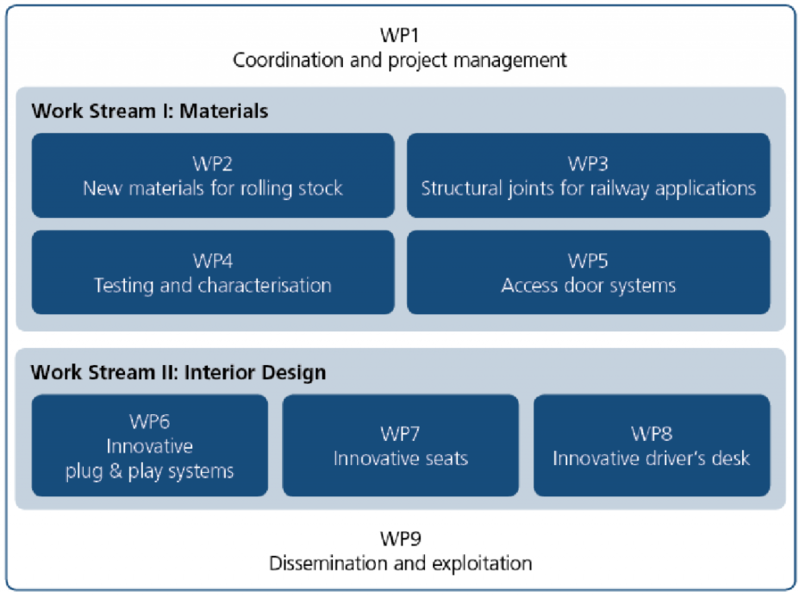 The Interior Design work stream is addressing the challenges and shortcomings of current rolling stock in terms of modularity in use, to meet the changing passenger demand during the 30-40 years of an in-service operating life-cycle of a train. This work stream is aimed towards tackling this challenge in three distinct sub-systems: innovative plug & play systems, innovative seats and innovative driver’s desk. 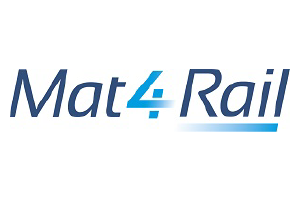 Mat4Rail aims to develop innovative materials and technologies, as well as design concepts within two independent work streams. Work Stream I of the project concentrates on materials, whereas Work Stream II addresses interior design. The Materials work stream is structured into four work packages (WP): Resin development, fibre selection and manufacturing of first composite samples and parts (WP2), Investigation of joining technologies of composites parts with other composites parts as well as with metal parts (WP3). Testing and characterisation of novel materials and joints (WP4). Investigation of new materials, architectures and manufacturing processes for the door leaves of a train’s access doors (WP5). The Interior Design work stream includes “Innovative plug & play systems” (WP6), “Innovative seats” (WP7) and “Innovative driver’s desk” (WP8). The Mat4Rail project results benefit several stakeholder groups such as the rail supply industry, rail operators, passengers, and the European economy. It will enable the introduction of new composites in the market to be available for the rail supply industry, reduce the weight of carbodyshell sections by up to 30% by developing lightweight FPRs, and optimise access door systems in terms of architecture and materials. Furthermore, new functions will be integrated in the carbodyshell and space for interior will be increased, and new joint concepts developed. Moreover, the innovation for seats and the driver’s stand will improve capacity, performance and comfort, and over the long run, Mat4Rail will create commercial opportunities for the rail supply industry. Europe’s railway industries require a step change in technologies and design for the next generation of rail vehicles in order to remain competitive globally. However, currently available structural composites do not meet Fire, Smoke & Toxicity requirements of the railway sector and thus cannot be used for the manufacturing of carbodyshell parts. Innovative materials and modular design for rolling stock are considered to become key to success in Europe’s railway industries. Composite materials with their unique properties, such as lightness or reparability have demonstrated a high potential for lighter, more energy- and cost-efficient structural components in relevant sectors such as aeronautic or automotive industries.